delights in communicating her feelings through shapes, line and color. Her artworks convey her response to the beauty of the earth. With each picture she creates, she invites you to share her inner most thoughts about life, truth and love. Her favorite subject? A person, a place or object she loves. This website gives a small representation of her large body of works. Private showings of her work can be arranged by appointment. Anne-Marit has enjoyed a lifelong love affair with the arts. This passion began in a rural setting in the midwest, where her life began. Creative experiences filled her childhood. Her mother, a concert pianist, and her Aunt Belle Mehus, saw to it that she had a well-rounded arts education ab initio. Her love of the arts deepened through her studies in Minneapolis, Aspen, New York City and Europe. She studied music at the Mozarteum in Salzburg, Austria; and painting with renowned German Expressionist painter Oskar Kokoschka at his International Schule des Sehenes at the Festung Hohen Salzburg in Austria. Her studies were intertwined with a successful performing career as a coloratura soprano. Anne-Marit has distinguished herself in the arts on many levels: as an artisit, performer and community volunteer. Her many honors include the North Dakota Governor's Award for the Arts (1981), the Ladies Home Journal American Heroine Award (1984), and the President's Volunteer Action Award, which was presented to her in the East Room of the White House (1984). This multitalented creator has proven that the arts bring people together in special ways in which they forget differences and enjoy common bonds. She continually works toward that end, believing people need enrichment, like a plant needs water. 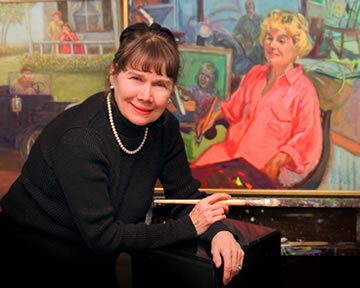 She has spent her lifetime bringing artistic nourishment to others. She is known as an artist with a sense of history. Many family members, including her grandparents and great grandparents, pioneered in Dakota Territory. Often, for subject matter, she draws from her Dakota sketchbook. She has a special interest in the rich heritage of Dakota. The spirit of adventure inherent in pioneering days comes to life in her artwork. The message she conveys transcends time and place. She also loves travel. Places she has enjoyed around the world very often grace her canvases. Mystical moments and celebrations are favorite subjects. She is living proof that no one ever grows too old for Santa Claus. Her paintings portray a life-long year-round holiday spirit. Paintings by Anne-Marit (aka Mumsel) can be viewed in the permanent collections of many educational and commercial institutions, as well as in private collections. throughout the USA as well as in Europe, Scandanavia and Asia.